There are few things worse than hopping into what you think will be a relaxing, hot shower but instead being immersed with water temperatures that are colder than the weather in the middle of January. It’s one unpleasant way to realize – “Ah, yes, a broken water heater”. HTP knows, typically, that if you’ve experienced this first hand, you want to make sure you never have to again and we want to help! Below are just a few ways to detect that it’s time to get rid of that old water heater BEFORE you learn the hard (cold) way. Water tanks should be seen and not heard. If you happen to hear any kind of rumbling that may sound like thunder, it’s your indicator your water heater is starting to go. The reason for any noise would be the sediment build up that has hardened in your tank and is banging against the heater. Usually, like a domino effect, leaking will come shortly after you hear the noises. It would be best to address the noise as soon as you hear them to avoid any further damage or loss of hot water. Pooling is NEVER a good sign when it comes to water tanks. If you ever notice moisture or pooling around the tank it is definitely time to get it replaced. Tanks tend to get wear and tear over time and as the metal heats it expands and cracks causing leakage and pooling. Another sign of a water tank being on its way out is the color of the water. If you are seeing a red tint to your water that usually means rust is beginning to form inside the tank. After rust comes leaking and a new water heater. In the case of your water heater, how it looks on the outside matters. 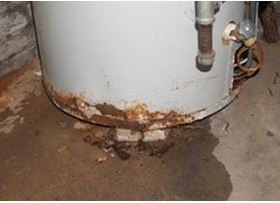 Check for rust and corrosion every now and then and pay special attention to any rust that may be forming around the temperature and pressure relief valves, or near the inlet and outlet connections. Now go check those water heaters and if yours does match one or more characteristics on our list visit our website here to get you on your way to a new water heater!